New CRD features will be added alongside classic CRD allowing entitled users to experience the benefits of the new system while still having the combined full functionality of both systems to complete their work. Keep in mind that during this development phase, new CRD features interact with classic CRD. If users do not have the necessary classic CRD privileges for an activity or link they select in the new CRD system, an Access Denied message will display. We will update this page as enhancements are made to CRD that affect entitlements for firms and individuals. Learn more about the new CRD system’s available entitlement privileges as well as upcoming and past systematic entitlements. FINRA will notify firms when we systematically entitle users and administrators to features added in the new CRD system. Learn more below about previous and upcoming systematic entitlement parameters. Entitled SAAS and CRD administrators can grant or remove access to these system privileges as appropriate for their users. Please see the FINRA Entitlement Reference Guide for complete instructions about managing account access. Effective January 26, 2019, "My CRD" will control access to new CRD features that allow users to search and view individual information. Users and administrators entitled with the “View Individual Information” privilege highlighted in blue in the screenshot below will be systematically entitled to the “My CRD” parent privilege. 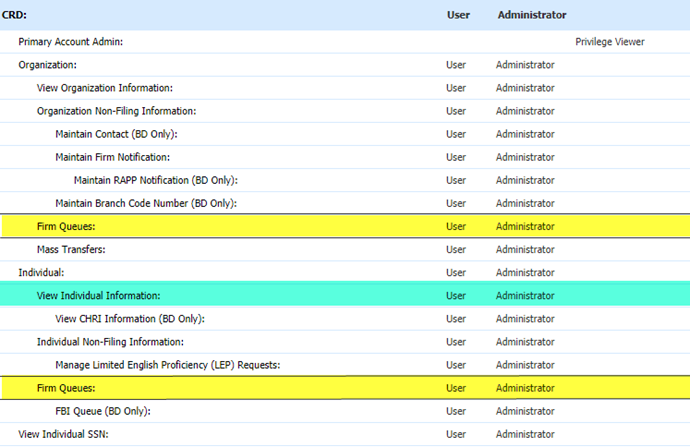 Users and administrators who possess entitlements for both Organization and Individual classic CRD “Firm Queues” privileges highlighted in yellow in the screenshot below were systematically entitled on June 30 to all three new CRD privileges that were available ("My CRD," "Activities," and "Reports").